The XIII Ordinary Session of the Synod of Bishops will be held in Rome October 7-28 on the theme, “The New Evangelization for the Transmission of the Christian Faith.” The Emerging Theologians Network, in partnership with the International Catholic Movement for Intellectual and Cultural Affairs (ICMICA-Pax Romana), is collecting blog posts on the synod’s theme here. The upcoming synod of bishops (7 to 28 October 2012) on the theme: “The New Evangelization for the Transmission of the Christian Faith” offers us a great opportunity to rediscover our baptismal vocation to participate in the church’s mission in the world. The idea that all of us, lay and ordained, are called as the people of God to participate in the mission of the Church is perhaps one of the most important legacies of the Second Vatican Council. The idea of the New Evangelization has been chosen to address the challenges facing the Church, particularly in Europe and North America, in the 21st Century. Like Blessed John Paul II, Pope Benedict has expressed concerns about the need to enliven and revitalize the faith, Christian identity, and proclamation of Christ, especially in places where the Christian community is in crisis. See the Instrumentum Laboris for the Synod. These are indeed critically important concerns given the decline in church membership in Europe and North America; apathy among Catholics in relation to their baptismal vocation to mission; polarizations within the church; and the different institutional crises stemming from the sexual abuse crisis. At the same time, the church (which exists in the world) and its evangelization cannot ignore the continued realities of poverty, injustice, and suffering that impact the lives of billions. An integral approach to evangelization, based in the incarnational Christology of Gaudium et Spes, is not satisfied with a disincarnate spiritualism. This approach takes into account the social, psychological, and material needs of the person, including the sins of poverty and marginalization. Following the council, the Latin American bishops in CELAM understood this connection and it was with them and their concerns for the poor that the term “new evangelization” first emerged. The 1971 Synod of Bishops made this connection clear as they taught that action for justice is constitutive of evangelization. Following the 1974 Synod, Pope Paul VI modified the tone of this slightly, but insisted that action for justice was an integral part of the mission of the Church. For him evangelization would be incomplete “if it did not take account of the unceasing interplay of the Gospel and of man’s concrete life, both personal and social.” Although he is critical of some understandings of evangelization that reduce it only to the social dimension, Blessed John Paul II maintained a strong connection between social concerns and evangelization in his 1990 encyclical on mission (Redemptoris Missio). 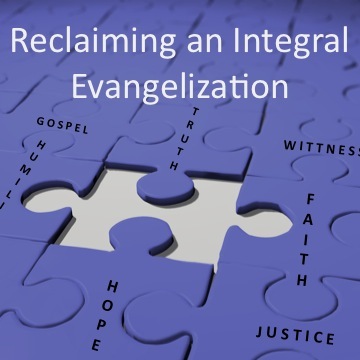 Sadly, this integral vision seems absent in many of the discussions and preparatory documents for the “new evangelization.” Rather than seeing action for justice as a central aspect of evangelization, some of the recent debates even suggest that concerns for justice and the option for the poor are to blame for decreasing Church’s involvement. Several commentators have bemoaned what they see as a horizontalism or an application for social concerns without the explicit reference to Christ. Whether it be new or old, evangelization cannot ignore the demands of our apostolic mission to the poor and to justice. As the epistle of St. James reminds us, the preaching of the Gospel without social action is both incomplete and un-credible. In the end, we must be careful not to combat the supposed Godless activism with a disincarnate spiritualism. As the synod begins its work, let us pray for our bishops that they may have the courage to envision an approach to evangelization that address the complexities and challenges facing the church and human family today.